FireKeepers Casino Hotel in Battle Creek, Mich., is reputed to be the best regional casino in western Michigan and northern Indiana, and operates one of Michigan’s few AAA Four Diamond rated hotels. When the owners opened an upscale gas station and c-store on the property, called FireKeepers Pit Stop, the executive team wanted to convey the same high standards and experience to casino guests, local residents and Interstate travelers who would frequent the facility. In order to advertise what was inside the c-store in a manner that reflected the quality of the casino and hotel, managers decided to install signage that included a full color digital message center from Watchfire Signs. 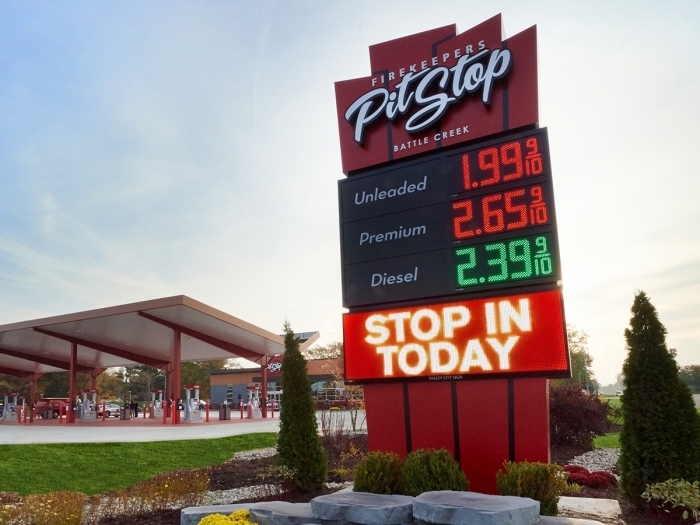 The Pit Stop uses the sign as an attractive way to advertise specific products, including highquality, ready-made sandwiches and meals, morning coffee specials and fresh donuts from a well-known local bakery. The 22 foot high sign was designed and fabricated by Valley City Sign, of Comstock Park, Mich., which also specified Watchfire messages centers for other signs on the FireKeepers property. The FireKeepers staff quickly learned how to design and program messages on their Watchfire message centers using Watchfire’s Ignite software. The marketing staff now knows what kinds of messages work best and can make sure they are delivered at the right time. “Our marketing staff works with multiple software systems on the property and finds Watchfire’s Ignite to be one of the easiest to use,” said Wise.